Listener Timothy shares a story that rings true with us and our motto: Always Be Performing! 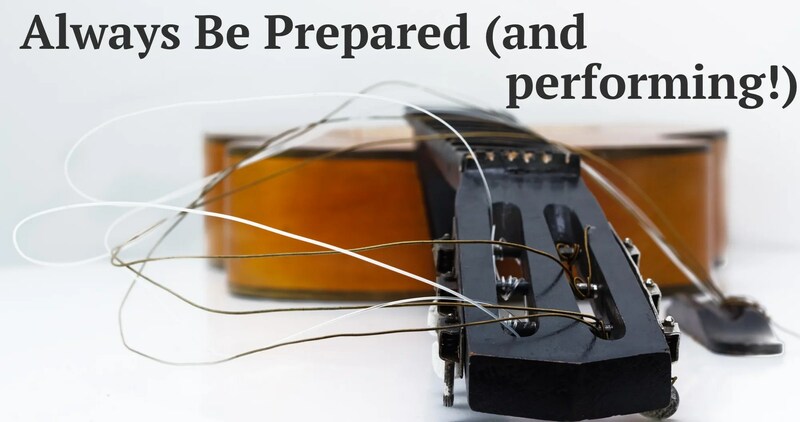 Before we get to that, though, there’s a conversation about another ABP motto: Always Be Prepared. And that doesn’t just apply to equipment – though it’s important there, too – it applies to people. Things just don’t always work out as expected, and that’s a lesson both Paul and Dave seem to continue to have to learn. Their advice: learn from them so you don’t have to make the same mistakes yourself. To do that is easy: just press play and enjoy! Hey Paul, Do you play in San Francisco area? I’m sitting in the Hilton Union Square listening to gig gab and I just looked up LosGatos and see it’s an hour away. I’d love to meet you and hear you play. Hi John – Just got this – I am in Los Gatos/San Francisco area (about an hour south) – how long are you in town? I’m playing Sunday 3 – 5pm in Los Gatos at a festival.